I want to answer that question here because I think many other readers will be wondering the same thing. But before I answer the question, I have to address something super critical. Based on Keith’s questions, I think he could be suffering from a “disease” called FOMO. It starts with our lizard brain… and that frequently provokes feelings of anxiety and restlessness. If you suffer from FOMO, you’re probably thinking that others experience more pleasure, success, or fulfillment than you. It doesn’t really work that way, even if we feel that way. Let’s dig into the recent oil rally, for example. 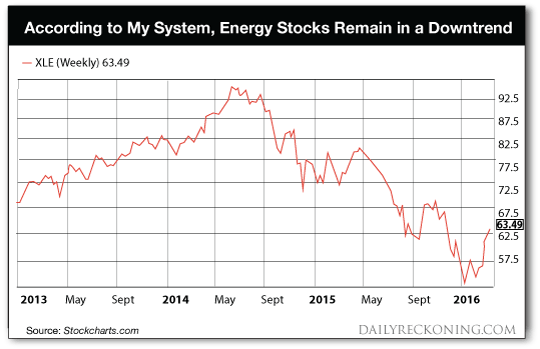 Keith is right about the positive movement in energy stocks. Over the past month, crude oil is up about 50%, and energy stocks are up about 18%. But keep in mind… this 50% rise in the price of oil after such a massive drop skews our thinking. For example, if a stock goes from 10 to 1 and then rises 50% where are we? See how the perspective changes the thinking? That’s why FOMO is so insidious, so dangerous. It makes you get into trades at the wrong time, often right before the trend reverses. Think how about many lemmings bought tech stocks at the zenith of the market in 2000 because of the fear of missing out on the Nasdaq going even higher. Think about how many people were flipping houses in 2006 because of the fear of missing out on easy housing money. Investment decisions based on emotions almost always end in chaos. So how do you cure yourself from the dreaded and paralyzing FOMO condition? And, getting back to Keith’s question, is it finally time to buy energy stocks? After such a wham bam thank you ma’am rally, it’s normal for investors to think that we’ve seen the bottom and oil is headed to $200 a barrel. But if you do a little research online, you’ll find conflicting views. The Russian central bank is not alone. Goldman Sachs, for example, recently issued a note saying this recent oil and commodity rally is unsustainable. 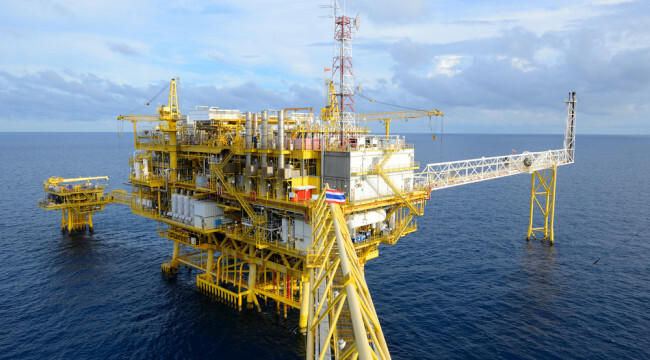 They say there is too much oil, and oversupply will keep prices low for some time. Further, many energy companies won’t earn a profit unless oil gets back to $50. With oil still below $50, one-third of U.S. oil producers could go bankrupt this year, according to The Wall Street Journal. This wave of bankruptcies could trigger another leg down in oil stocks. In other words, there’s no guarantee oil will go back to $100 a barrel and energy stocks will go to the moon. Does that mean it’s guaranteed that oil will head back to $30 or even lower? If I’m confusing you, that’s because that’s what fundamental analysis does. It confuses. Big time. See, the Russian Central Bank, Goldman Sachs and the Wall Street Journal are just issuing opinions based on their version of predictive fundamental analysis. They could be totally wrong. They could be totally right. Feel like you just landed at Vegas Friday at midnight ready to hit the craps tables? Instead of relying on asinine bank opinions typically designed so they can just pull more fees from your account, I want you on a different path. Just follow the trend up or down. This will also automatically eliminate your FOMO. If you’re using a trend following system, like the one we use in Trend Following with Michael Covel, there’s no need for emotions, guessing, checking with CNBC, runs to the toilet, calling uncle Harry, checking Janet Yellen’s pantsuit color or any other ludicrous piece of data. Instead of focusing on could-be, would-be and should-be, you focus on what is right now. So, what is the trend in oil and energy stocks right now based on the price action? The chart above shows the performance of the Energy Select Sector ETF, which tracks the performance of energy stocks. And it’s clear the sector has had a big rally. Despite that, both crude oil and energy stocks remain in a long-term downtrend according to my system. If the rally continues, the price action alone could change that analysis. But you have to get to the “buy” signal first. You don’t jump the signal. No signal, no long position in oil or oil related markets–yet.